Every rifle shooter should have access to a borescope. These devices reveal the condition of the inside of your barrel. Do you have a carbon ring problem? Is there jacket fouling near the muzzle? Are the edges of your lands worn away? All these common conditions can be revealed by a quality borescope. And now new digital/optical technology makes the borescope easier than ever to use. For 2015, Lyman will introduce a new, affordable borescope that employs digital imaging (with a micro-camera). You no longer have to peer into an old-fashioned eyepiece. With the new Lyman borescope you can view the inside of your barrel via a small portable display screen. That’s handy. In addition, the borescope images can be displayed on your laptop or mobile device. Lyman provides a USB cable and software that allows you to view the borescope’s image output on your computer (plus you can record images for future reference). The unit fits bores .20 caliber and larger. Lyman’s new Borescope provides active shooters with the means to carefully inspect the bores of their firearms for wear, throat erosion, tool marks, and other rifling or chamber damage, as well as for checking for fouling. The scope will fit 20 caliber and larger barrels and works with miniature camera technology. The display will show a clear image of the inside of the barrel and also allows you to take a photo of the bore. The image will storage on a standard SD card and can later be viewed on a computer or lap top. A separate cable (with USB connection) and CD are also available so that the Borescope rod can be connected directly to your computer or lap top. If you prefer to view only on your computer or lap-top, the Borescope rod is available separately (without the display unit) and plugs into the computer with a USB connection. 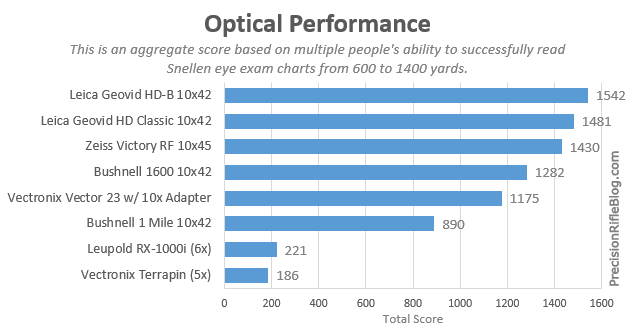 Share the post "New Lyman BoreScope with Digital Screen and Output to Laptops"
Last year, PrecisionRifleBlog.com published results from the most comprehensive field test of rangefinder binoculars ever conducted. The comparison test included virtually every product then available in the USA. If you are thinking about getting a set of binoculars with range-finding capability, you should definitely read this test. Here we summarize key findings of the test, but you’ll want to read the FULL STORY. Six range-finding binocular optics (and two monocular rangefinders) were field-tested in a variety scenarios to see which had the best performance in terms of both optical clarity and ranging capabilities. The results are based on over 10,000 data points collected from the field over 3 months of testing. Cal Zant, author of PrecisionRifleBlog.com, published a series of posts with exhaustive details about his optical and ranging tests and results, but we’ll hit the highlights here. Share the post "PrecisionRifleBlog.com Tests Range-Finding Binoculars"
According to CNN, more guns were sold on November 28, 2014 (Black Friday), than on any other day in the history of the United States. Background check processing was running well ahead of Black Friday 2013 when the previous single-day record of 144,758 FBI-processed gun transactions was set. In fact, so many Americans lined up to purchase firearms on Black Friday 2014 that the FBI was processing three background checks every second. An FBI spokesman said that FBI staffers would be working overtime all through this weekend to deal with the vast number of background check requests, working to ease the backlog. Share the post "Black Friday 2014 — More Guns Sold Than Ever Before…"